Nickel boron has often been compared to NP3. Nickel boron claims some of the same benefits as NP3 and the manufacturers of this finish put on a big marketing show. It is time that we put this inferior finish to rest and put the facts in the open. You will see that the friction starts higher and can go twice as high as NP3. Both of these are averages of multiple tests and you can see NP3 is more consistent where nickel boron has a larger standard deviation. Also tests are done on a brand new finish so both finishes have no wear to begin the test. Even more important than just the numbers is how each finish achieves these coefficient of friction. NP3 has PTFE also known as Teflon® co-deposited in the nickel matrix. 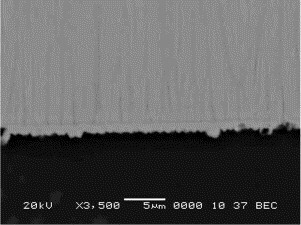 As wear occurs new PTFE particles are exposed and the self lubricating properties continue. Nickel boron has a surface with many high points. Because the high points make all the contact, there is less surface area for friction to occur. The problem with this is once the high points wear down the coefficient of friction increases due to more surface area being contacted. With no self lubricating particles like Teflon® in the nickel boron matrix there is no additional lubrication after the contact points are worn. Bottom line is that if you see wear on nickel boron it has lost it’s “self lubricating” properties at that spot. NP3 is easy to clean for the same reason that a pan with Teflon® is easy to clean. Teflon® is non-stick and easy to wipe down, therefor carbon does not adhere to the surface. Nickel boron has many ridges to catch carbon fouling. The ridges in nickel boron are smaller than the ridges in manganese phosphate, that act as a sponge for oil, so compared to manganese phosphate, nickel boron is easier to clean. This is the same as comparing a rail road spike to a nail in your tire. One is definitely worse than the other, but both will impede function. This is a picture taken after 200 rounds were fired through each bolt carrier group. NP3 has great corrosion resistance twice the amount of nickel boron. NP3 Plus has ten times the corrosion resistance of nickel boron. Share this blog post on Facebook, Twitter, and in forums. No more guesses or slick marketing. We use data to prove our points please make sure you do the same.